The three-year undergraduate course in Biomedical Sciences is a broad and flexible programme, ranging from genetics and molecular and cellular biology to integrated systems physiology, neuroscience and psychology. Depending on the options chosen in the second and third years, students graduate with a B.A. 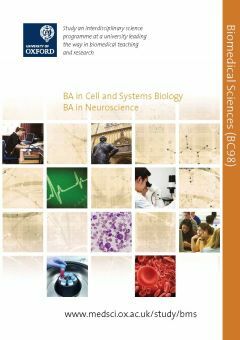 degree in either Cell and Systems Biology, or in Neuroscience. Information on the admissions process, including open days, introductory reading, selection criteria, and interviews. I did better than expected in my A-levels. Does Oxford University take part in the clearing and adjustment process?